This morning, the City of St. Petersburg received three bids from developers for the redevelopment of the Tropicana Field site. I haven't had a chance to read through the proposals yet, but here are a few highlights. You can see all of the information yourself on the City's website. 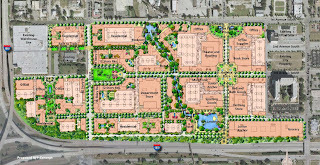 Archstone Madison proposes a ten year build-out with a total of 5,448,850 SF (FAR 1.45) of development with a construction value of $1,209,061,290. This includes 1,126,000 SF of retail/restaurant/entertainment, 800,000 SF of office, 2,690 units of residential, 600 hotel rooms, and 10,088 parking spaces. This team features a design team of Torti Gallas and Partners with Glatting Jackson Kercher Anglin. 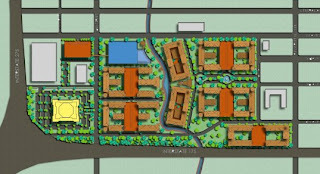 Hines Interests proposes a ten year build-out with a total of 3,095,803 SF (FAR 0.81) of development with a construction value of $880,000,000. This includes 855,000 SF of retail/restaurant/entertainment, 200,000 SF of office, 1,173 units of residential, 200-250 hotel rooms, and 6,850 parking spaces. This team features a design by EDAW. Williams Quarter proposes a seven year build-out with a total of 4,410,000 SF (FAR 1.18) of development with a construction value of $773,440,315. This includes 360,000 SF of retail/restaurant/entertainment, 125,000 SF of office, 4,000 units of residential, and 250 hotel rooms. This team features a local design team consisting of Reliable Group Architects, Land Design Landscape Architects, and TBE Group Civil Engineers. At first blush, the urban design and architecture are even worse than I could have imagined. Again this is based on just a quick look over the 3 proposals, but I don't really see anything more than a glorified mall without a roof. I expect more design-wise from both the EDAW and Torti Gallas/Glatting Jackson. The FAR's of right around 1.0 seem REALLY low for such an urban site. More commentary to come once I have a chance to digest some of the information. At one time, the only thing of interest on the I-4 drive from Tampa to Lakeland was the Dinosaur marking the exit for DinoWorld. Now there is a new piece of Americana. The locally nicknamed "Airstream Ranch." Unfortunately, the art critics within the Hillsborough County Code Enforcement have spoken up and deemed this to be a code violation and NOT art. The owner has been given 30 days to take down the Airsteams. more info here. story1. story2. gallery. story3. story4. Creative Loafing is holding an "art" event in Ybor on March 29. Wide arrange of artists, musicians and other things creative. Admission is $10 Check it out. 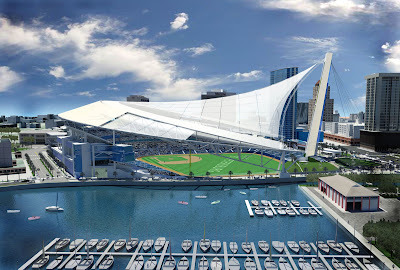 Today the Tampa Bay Rays submitted some more details on their plans for a new ballpark on the downtown waterfront. The "Detailed Design Submittal" and "Transportation and Parking Submittal" are available, as well as some other information, from the City of St. Petersburg. Parking has been one of the key hot button issues for stadium opponents. The parking study suggests that there are about 14,000 parking spaces that would be available for game parking. This figure does not include the 7,000 on-street spots in the area. The preliminary design package includes additional information regarding the design of the building (including the retractable sail roof), public amenities, streetscape improvements, and a sustainability plan. It is anticipated that the new stadium will achieve LEED certification, one of the first professional sports venues to do so. Stay tuned for more as the RFPs for the redevelopment of the Tropicana Field site are due next week on March 18th.